Fabric composition : This vintage girls dress is made of Woven 96% cotton + 4% elastane, soft and comfortable,little stretch. Short sleeve,round neck,invisible zipper closure at back,knee length. 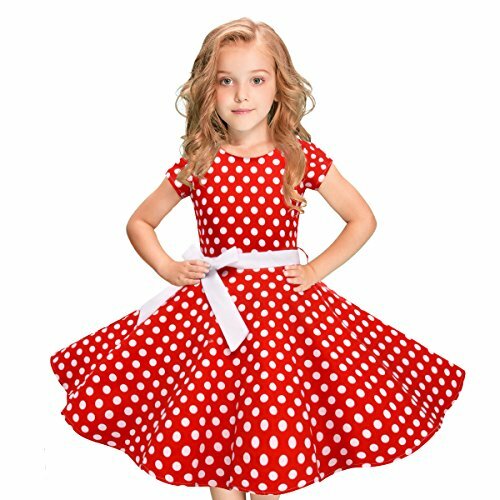 Full lined dress, big swing skirt,great for swirling,dancing,recital,etiquette class,party, wedding, banquet, church, school, formal and business casual etc. Beautiful and elegant everywhere!Got many compliments! Regular machine wash and dry. May need iron if necessary. If you have any questions about this product by selina5858, contact us by completing and submitting the form below. If you are looking for a specif part number, please include it with your message.